Yo Yo Honey Singh, who is much loved by Bollywood big wigs, has been the centre of attraction ever since his return. The singing superstar who was out of action for 18 months as he was battling bipolar disease is back to get his audiences grooving. He has been in huge demand from all quarters. 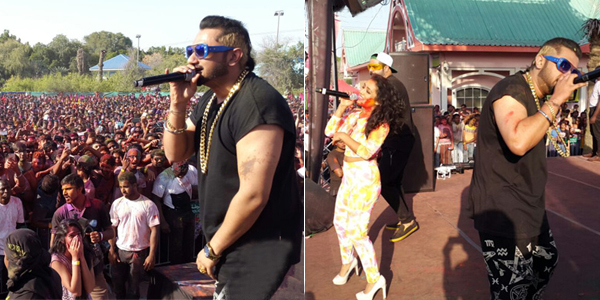 Yo Yo Honey Singh is on every event organisers wishlist and it shows! The desi kalakar gave his biggest LIVE performance at TOIFA Awards in Dubai which received a tremendous response. After entertaining the TOIFA audiences Singh was invited to perform at a popular Holi Party, "Rang De" in Dubai. Being the Rockstar that he is, Yo Yo Honey Singh got the middle eastern audience grooving to his tunes. The venue was filled with thousands of Yo Yo Honey Singh fans. The event, that had a 360 degree stage setup was chanting the superstars name throughout and had a gala time. Yo Yo Honey Singh is a huge sensation not only in India but in Dubai too. And this was proved with him delivering a Live performance and a Live concert in Dubai right after his return.